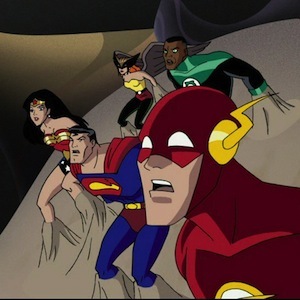 This blog takes a look at episodes from the Justice League animated series from a tabletop roleplaying game perspective, both in terms of game design and game play. The remaining heroes stage a rescue attempt, with Flash distracting the tripod on guard and luring it into stepping on one of the invaders’ own mines, showing he’s learned something from the previous encounter. J’onn can telepathically sense the captives’ whereabouts, at least in general terms. J’onn uses his shapeshifting abilities to lure guards around the corner, then his density powers to sneak up behind them and take them out. This is the first time to my knowledge of the Martian Manhunter using the “density attack” trick first made popular by the Vision in Avengers (a character with a similar role to J’onn in some regards). Green Lantern is able to cut through the wall of the alien vessel to reach Superman and Hawkgirl, but it’s a trap! The same yellow gas jets out to overwhelm the heroes. Even Green Lantern cannot focus enough to use his ring to save them. They’re all captured. As I’ve mentioned numerous times before, these types of captures tend to be fait accompli in game terms: something the GM gets to declare, perhaps rewarding the players with some compensatory bonus for later. Certainly, relying on all of the heroes failing their resistance can be asking for unexpected plot twists, unless you amp and fine-tune the trap so much that they can’t possibly succeed, in which case, why not just skip to “you all get captured” in the first place? The heroes wake up bound hand-and-foot in the alien substance of the ship, confronted by the alien who has assumed the identity of Senator J. Allen Carter. When the Imperium arrives, it takes the full opportunity to gloat and torture J’onn J’onzz for his defiance. Turns out J’onn is playing for time and the Imperium begins to suspect just as the Martian calls out “Now!” and Batman reveals himself! Mentally shielded from detection, Batman has sabotaged the alien equipment (by “reversing the ion charge”). We learn the aliens have a weakness: ultraviolet radiation from the sun, which is why they are nocturnal. A bit of a cross between the classic vampire and the White Martian weakness to fire (in a comic story that loosely inspired this one). The heroes rally, breaking loose and taking on the aliens, felling them in large groups. The Imperium manages to break loose from J’onn and retreat to its shuttle, but Wonder Woman lassos the ship before it can escape and Hawkgirl disables it, causing it to crash back into the alien base. In the aftermath, the heroes meet on board an orbital station—the Watchtower—financed by Batman with “a line item in the aerospace R&D budget” of Wayne Enterprises. Superman pitches the idea of them staying together as a team and they all agree, save for Batman who—despite having obviously anticipated this—prefers to maintain at least the image of his “loner” status by becoming a “part-time” member of… The Justice League! What does this episode teach us about superhero RPGs? “I Can Sense It” This episode gets a lot of milage out of the Martian Manhunter’s extrasensory powers: he senses when Superman and Hawkgirl are captured, that the Imperium is on its way, and the location of the captives (although the last turns out to be a trap – which J’onn also senses, but a moment too late). Game systems have to consider how to communicate sensory (and extra-sensory) information to the characters and the players, and allow players to act upon it. In the Sensory Powers profile for Mutants & Masterminds, I talk about the “parrot syndrome” and how players often end up parroting back the GM’s descriptions of things, or going with the simpler “I tell them everything you just said”. To what degree is J’onn’s player making up elements and adding them to the story, and to what degree are things guidance and description from the GM? Many systems allow for players to “scene edit” in different ways. Is the Imperium trap a twist the GM imposes on the heroes’ efforts? Or is J’onn’s last-second declaration that something is wrong a player invoking a trap for some extra hero points? Damage vs. Damage: In quantitative terms, Wonder Woman’s strength and Green Lantern’s power ring are fairly comparable, yet Wonder Woman can’t even budge the wall inside the alien ship, while GL’s ring can cut through it. This raises the issue of qualitatively different forms of damage. A prime example is the Hero System’s Normal and Killing Damage; give the wall enough non-resistant defense and sheer strength won’t matter, but a focused cutting beam (doing Killing Damage) can make it through. In systems like Mutants & Masterminds it may be more of a matter of descriptors, where bludgeoning or force damage has little effect, but cutting or energy damage has more. The first example is more “hard-wired” into the system, while the latter is “soft” and situational, largely decided by the GM. Invasion Beats: “Secret Origins” draws from several elements of Justice League history: the team’s debut in Brave & the Bold was against an alien menace (Starro the Conqueror). Their retrofitted origin was repelling an alien invasion (the Appallaxians, also mentioned in the Young Justice animated series), and a relaunch of the JLA title began with a White Martian invasion of telepathic alien shape-shifters. The story follows the classic “invasion” structure: hints and build-up, the invasion itself, the revelation that the invaders have a weakness, upping the ante with the arrival of the invasion’s leader (the revelation of the master plan, ultimate weapon, etc. ), and the opportunity for the heroes to use what they’ve learned to turn things around before it’s too late. A Line Item: Batman casually dismisses the creation of the Watchtower, but superhero RPGs often devote considerable time and space to headquarters and how they are acquired and used. Many—like Hero System and Mutants & Masterminds—treat HQs as a form of “equipment” and ask heroes to pay for them in the currency of the game, usually having a team all chip-in. Others use cost- or resource-estimating rules (like Resources in Marvel Super-Heroes or Wealth in DC Heroes) and still others treat them as background color, special advantages, or plot devices. Regardless, the expectation is that any self-respecting hero team needs an HQ and the nature of that headquarters says something about them. Interesting to note that the “watchtower” is initially intended to watch “out there” away from Earth, although later it becomes a question about looking down on the Earth as well. This entry was posted in Re:Animated and tagged game design, justiceleague, reanimated, rpg, superhero. Bookmark the permalink.